I don't make Indian desserts very often, as I tend to find them quite rich and very sweet. 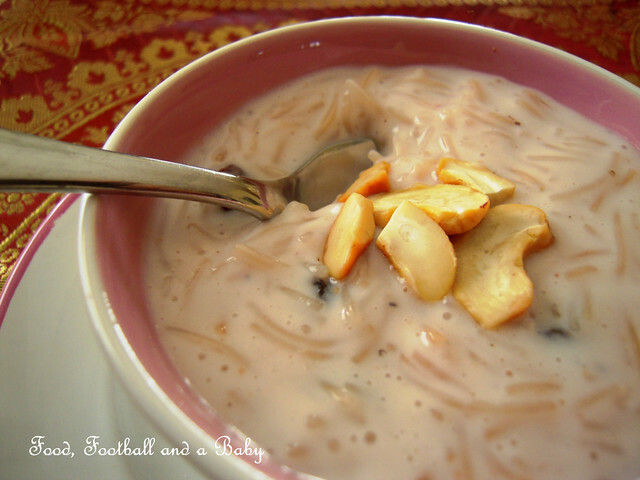 However, after buying my semolina vermicelli, I was quite tempted to make this version of kheer or milk pudding. 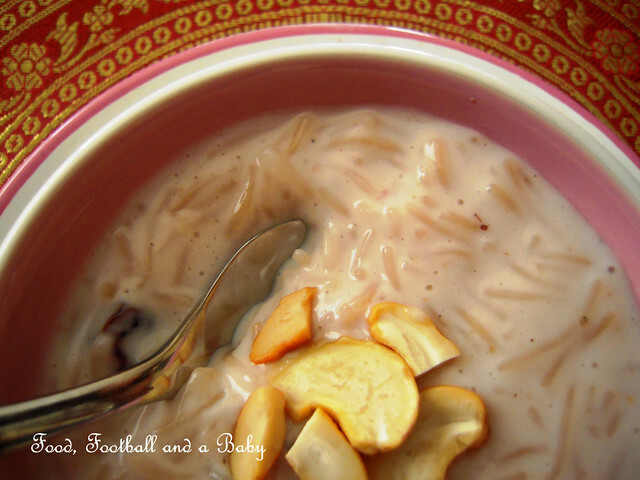 Normally kheer is made with pudding rice, as its the Indian version of the British rice pudding. But the vermicelli version is very popular in India too. Normally, kheer, like kulfi, takes a long time to make, as you have to stand over and stir milk until it has thickened. Me, I am essentially a lazy cook, so no way are you going to catch me spending hours stirring. So I looked over for a shortcut kheer recipe, but nothing I found seemed to really inspire me. I looked at the back of the vermicelli packet, and it had instructions on how to make a basic kheer. So I figured I should be able to make up my own recipe, using that one as a base. The kheer actually didn't take me very long to cook in the end. I reduced down the sugar, and used a mixture of milk and cream as the base, instead of just milk. I also used cornstarch as a shortcut instead of thickening the milk the traditional way. Then, when I tasted the result, I thought it needed a fruity kick, so I whisked in some pureed strawberries. The strawberries were a great addition. They were slightly tangy, and really cut through the richness of the dessert, and you could just about taste them. They also paired really well with the rosewater and cardamom, with each flavour really quite distinct, and they gave the whole dessert the palest pink colour, which was really pretty. The next time, I am going to try this dessert with pureed mango and saffron, as I think that combinations would work really well too. I served the kheer in small bowls, and enhanced with the fragrance of rosewater and strawberries, this was a surprisingly pretty and mellow dessert, with hints of East and West, which I quite enjoyed. Heat the ghee or oil, and fry the vermicelli for roughly 3 - 4 minutes, or until light gold in colour. Keep aside. Crush the cardamom seeds to a fine powder. Whisk the cornstarch with the 2 tbsp milk until smooth. In a saucepan, heat the remaining 1 cup milk, cream, sugar and powdered cardamom, until just steaming. Add the fried vermicelli to it, and cook, stirring often for 7 - 8 minutes on a medium heat, stirring often. The milk/ cream mixture should just start thickening, and the vermicelli should be cooked by this point. Add the cornstarch/ milk mixture to the above milk/ vermicelli. Cook for an additional minute, then take off the heat and stir in the rosewater. The mixture will be quite thick at this point. Meanwhile, puree the strawberries finely with the milk. 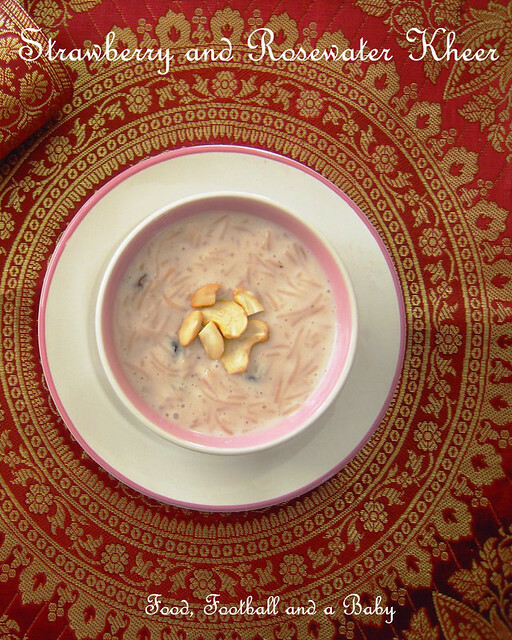 Whisk in the strawberry puree into the slightly cooled kheer, along with the cashew nuts and raisins. 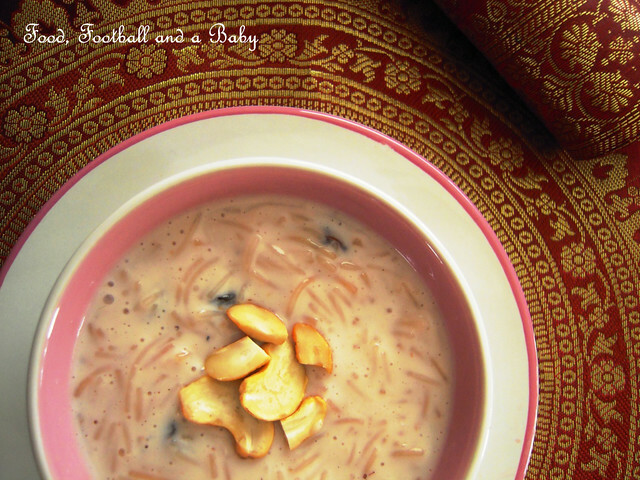 You can serve the kheer just warm or cold. Serve garnished with a few more cashews. Yumm! Michelle, I want some too! The cornstarch used for thickening was a great idea, I dread stirring too! even though this sounds so lovely i know it's something I wouldn't like as i'm not a big fan of milk puddings... although maybe this is the one to persuade me eh? @Dom, see, in my opinion, if you don't like milk puddings you really won't like this. My husband hates milk puddings and he just ate one bite of this and said, sorry, not for me... I didn't mind, coz I love this, but its a very much acquired taste. And a very Indian one too :-) I'll have to post up a dessert for you now... luckily I got my random recipe picked out and I think you'll like it! @Meg, thanks, its quite common in India, but I don't see very much of it around here... its pretty good though, but you have to like rice puddings, and if you do, you'll love this one.